Enemy agents are being picked off in rapid succession, and Steed is implicated. Convincing the other side that a third party is responsible, Steed calls a truce and teams up with them, invoking an impromptu agent exchange program so as to keep an eye on one another. While Cathy's partner is knocked off at the dentist's, Steed and his partner scrounge for clues at a hat and tie shop, which lead them to a gentlemen's training organization. If this sounds familiar, then you'll realize that "The Correct Way to Kill" is a remake of this episode. With much of the dialog intact, a few details are changed: the dentist becomes a chiropodist; the hat and tie shop becomes an umbrella shop; the shipping crates are full of bowlers instead of umbrellas; the innocent actress used as a warm body to keep Steed company becomes Olga, the trade-in spy; and Keller becomes Nutsky. While there are some aspects to recommend the original over the remake, such as more interesting plot twists, I'm sorry to say this one loses a bowler simply because I find Warren Mitchell's Keller nearly as annoying as his later two-time character, Brodny. The original version explains one aspect of the remake that has always nagged at me... After Steed sends Olga into the clutches of the chiropodist, he seems strangely concerned for her welfare. In the original story, he had sent in an innocent bystander, not a trained spy—true cause for concern! To me it appears Brian Clemens had not adjusted the dialog enough to suit the new circumstances. As an aside, does it bother anyone that here Steed is so concerned about an innocent being used as a pawn in a risky situation—in consideration of what he put poor Venus Smith through? 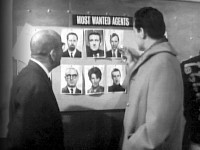 Ever notice the "mug shots" on the bulletin board at the finishing school, bearing the header "Most Wanted Agents"? 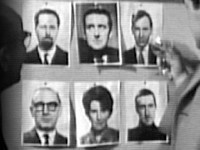 Aside from Steed, they are all photos of production personnel—that's Brian Clemens at top left. According to Steed, the painting in his flat is a portrait of his grandfather. 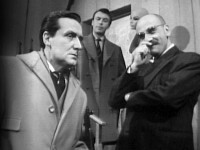 Some scenes were pre-recorded on 26 February 1964 in advance of the main recording. Steed asks Miss Lawrence if she would like a drink. "Not before sundown," she replies. "Of course, you could draw the curtains."